Dr. Alan Wilton is a canine geneticist with extensive experience in population genetics, disease gene identification and genetic testing. He has published over 60 peer-reviewed scientific journal publications. He has recently been involved in several high profile projects that have lead to high impact publications, for example Genetics Research in Aboriginal Australians published in Am J Hum Genet and Genetic Analysis of Dog Domestication in Nature. 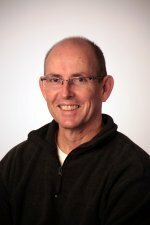 Dr Wilton is a member of the Executive Committee and the Management Committee for the Ramaciotti Centre for Gene Function Analysis (UNSW), a cutting-edge sequencing and molecular analysis facility. Dr Wilton received his PhD from the University of Sydney in 1980, this was followed by a post-docs position at North Carolina State University, UC Davis, University of Western Australia, University of Adelaide and Macquarie University. 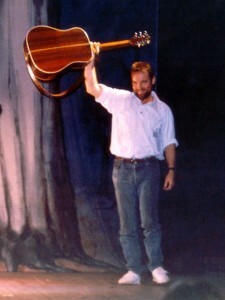 In 1991 he accepted the position of Lecturer in Genetics at the University of New South Wales. He has since been promoted to a Senior Lecturer position where he lectures on genetics and recombinant DNA techniques. Dr Wilton holds patents in the US and in Australia for genetic testing methods for diseases in dogs. He has a long-standing position as an assessor for ARC and NHMRC grant applications as well as reviewing papers for various journals. Dr Wilton currently holds tenured position with 50% teaching and 50% research requirement. He is a patron to 3 dog clubs and 4 dingo conservation groups. He is a committee member of the National Dingo Preservation and Recovery Program. He established DNA methods for distinguishing pure bred dingoes from domestic dog hybrids in late 1990s and has collaborated with various conservation groups and government agencies to assess to state of the wild dingo population. 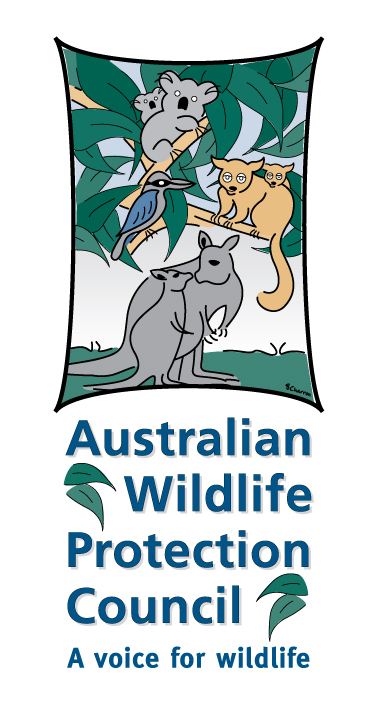 The members of the Wildlife Protection Association of Australia Inc. are dedicated and committed to the conservation and protection of our native wildlife. We provide a credibile and effective forum to bring community concerns and wildlife issues to a global stage. As a non-government community-based group, we lobby the Government at all levels to do better with wildlife protection, and to implement nonlethal wildlife management, for perceived wildlife overpopulations. With your help and support we will continue to do that. If you join our Association, for a small yearly fee, you can help us to continue our campaigns of community education. A small donation will help us even further, and you can do this from our membership page using PayPal or you could even mail us a cheque. for Brad’s Honours he studied small mammal habitat preference in northeastern Sydney remnant Bushland. He wrote a consultancy report on feral pigs for Department of Environment, Climate Change and Water NSW, and another on feral deer for the Sydney Catchment Authority. 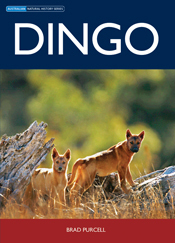 Brad trapped and released 52 dingoes in the blue mountains, wrote the book ‘Dingo’ for CSIRO Publishing Australian Natural History series, and has had extensive media coverage including 8 minutes on Catalyst about his PhD findings. Brad has taken the BBC into the field as scientific adviser for a documentary on lace monitors and their interactions with dingoes, and was awarded a Winston Churchill Memorial Trust Travel Fellowship to study proactive and sustainable management of wild living canids in Botswana, Poland, United Kingdom and United States. THANK YOU BRAD FOR ALL YOUR HARD WORK! Dip. Regional Economic Development, CARED. Member of the Australian Water Association. Policy and strategy development at government, industry and farm levels; institutional analysis and strengthening; national sector planning; meat hygiene and international marketing impediments; quarantine protocols; veterinary and public health; river and estuarine health; disease control and eradication; aquaculture; community development; watershed protection; agro-forestry; and management. Australia, Austria, Bangladesh, England, Fiji, Germany, Holland, Indonesia, Lao PDR, Madagascar, Malaysia, Papua New Guinea, Solomon Islands, Thailand, Tonga, USA, Vanuatu, and Western Samoa. “They say I have a gift of the gab, why not use it to speak out for those without a voice? It’s all about education. Tell it like it is, sprinkle with a sense of humour and get the message across without preaching. Animals have no voice. It’s up to us to speak and act on their behalf. Cruelty is cruelty no matter what the species. The Bob Irwin Wildlife Fund is a not-for-profit conservation organisation affiliated with the Royal Society for the Prevention of Cruelty to Animals Queensland, which is dedicated to the preservation of all wildlife and its habitat for future generations. We are inspired by Steve’s passion for conservation, and commit to continuing his vision to leave this world a better place. Hundreds of people from different backgrounds told us they were looking for extensive, up to date information on the environment and sustainable development. We started Eco Voice to provide a regular and broad overview of environmental information. We cover everything from renewable energy and sustainable building to natural living and organic agriculture. “The poor old Dingo, our only native dog, has been hunted down and persecuted ever since white man came to Australia. Although it is believed to have been introduced from Asia, approximately four thousand years ago, it has been recognised recently as playing a part in the balance of nature. Especially now that rabbits, goats, foxes etc are a part of our wildlife’s demise. Established in 1994, FAME is a national organisation with an impressive track-record of providing support for important conservation projects across Australia. 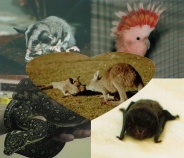 FAME focuses on providing support exclusively for Australian species most at risk of extinction, and for projects that will increase the likelihood of the survival of one or more of those species. FAME believes that a partnership approach to saving endangered species is the best use of scarce resources. We work with like-minded organisations on projects around Australia to save endangered species from extinction. FAME also conducts and supports programmes of environmental education so that future generations of Australians will have a greater understanding of the uniqueness of Australian wildlife and the Australian environment. 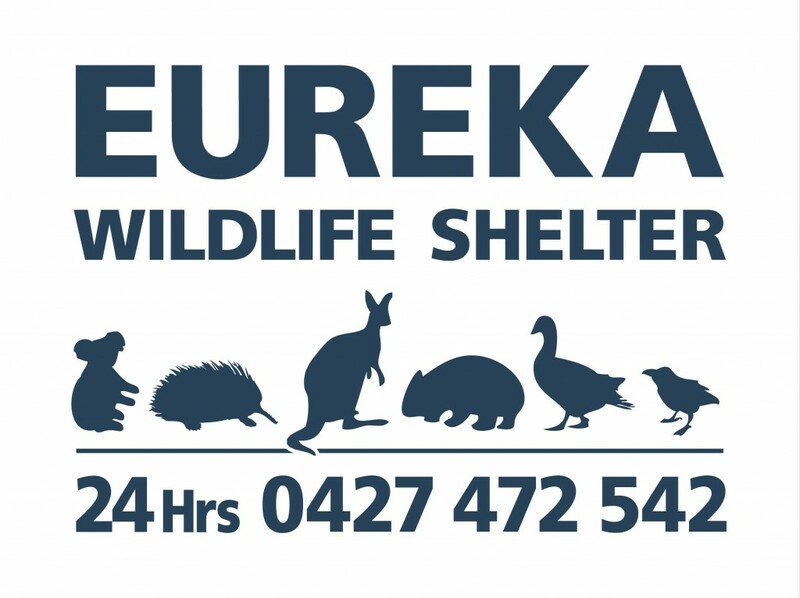 FAME’s objectives are to motivate and engage individuals, Trusts and Foundations, and the corporate community in our work; to raise funds in support of existing projects; and to establish sufficient reserve funds to respond to urgent opportunities to save Australian wildlife wherever and whenever they arise. In 2010 FAME has 850 financial members, and many thousands of loyal donors across the Australia and internationally. · To educate the community about the importance of the conservation of our unique Australian native animals and plants. Yellowpinch via Merimbula NSW 2548. Author and lecturer of macropod husbandry and disease. Education and Conservation form an integral component of Featherdale’s philosophy. Not only is Featherdale renowned throughout the tourism industry but also its extensive captive breeding programs have set the standard for animal conservation and management in the zoological industry. As a result, Featherdale animals and animal husbandry techniques are highly sought after by zoos and fauna parks all over the world. Moonlit Sanctuary Wildlife Conservation Park grew out of the childhood dreams of Chief Ranger Michael Johnson. Inspired by the British naturalist Gerald Durrell, who imagined a place where people could experience the rare and unusual animals that once roamed the Australian bush. The Eumundi Girls support Jennifer with her campaign for the dingoes. We are a group of ladies from Eumundi who formed a group to help the dingoes of Fraser Island and worked from the Eumundi Markets gaining support for the 2011 petition, presented at the Sate Parliament, November 2011. We must protest loudly and clearly and the public must demand a change to the flawed …. Fantastic to know there are still hard working people like you, who are passionate and activated to stand up for what is clearly correct. We are having our own fight against the DERM regarding their plan to make Middle Percy Is. a National Park, against the wishes of the majority of users (cruising mariners) and us. They have deigned to offer us a small Conservation Lease (only for 20 years).We spent $200,000 WINNING THE ISLAND BACK FROM A CON-MAN,(with Rebel bikey connections and mentality) WHO STOLE IT FROM MY COUSIN ANDY MARTIN, AND THE DEPARTMENT (DNR) DID NOTHING TO HELP. THEY SAT BACK AND WATCHED THE WHOLE MESS, and loss of the subsistance livelyhood, saying they couldn’t help and it was up to us to get Civil COURT ACTION (WHICH DRAGGED ON FOR 7.5 YEARS) AND NOW ACT LIKE THE EPA ARE THE SAVIORS!! If it wasn’t for EPA being dictoial , none of this would have happened. It cost us a further $60,000 to re-establish living inthe Homestead and fix major deterioration , and a further huge input needed of time and money to get back to before that crook stuffed everyone up (and is still laughing at the system) . Despite the Premier, Climate Change Minister saying in press release that the public are part ofthe disission making ; they clearly are not. We are attempting to get the DERM to follow the NCA 1992, for classification of the island as national park (recovery) which would provide a 3 year change over form existing lease(residential of whole island). That will ensure that the public are advised by newpaper what the DEM intentions are and give scope for feedback. At present they plan to skip all of that , and gazette the island as NP which’ll entail eradicating the ‘feral’goats; The cultural heritage value of those hardy little goats, is so important for future generations;- what if we can’t support cattle inaustralia any more with the climate changes forcasted? then those goat will be needed to fed the people the meat they so love. Anyway, we aren’t as good as you on the publicity and writting; but are encouraged by your stalwart effort. I will be writing to the governement to support you freedom to continue your quest.May the LORD protect and guide you, in your difficult times. Thank you for saving the turtles and shore-birds by your huge clean-up beach efforts. I love collecting rubbish, but have a long way to go to meet your collection piles!! Hi , my name is Mark Thornquest. 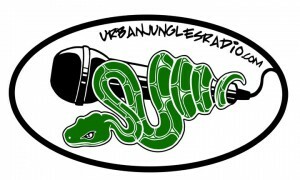 Based in Los Angeles, broadcasting free to air 24/7 across 14 platforms all over the world. Our program format support a modern lifestyle that is green ,healthy, and compassionate. 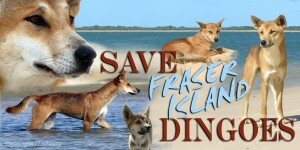 We would love to do a story On Saving the dingoes, especially those on Fraser Island. In doing so, giving the story worlwide exposure. I think your webpages look magnificent. Congratulations. I have sent a letter to the Newspapers in all states and the Fraser island Courier will publish it this week. Below for your perusal. Another dingo killed on Fraser Island – in a ‘Sanctuary’, a place that is WORLD HERITAGE listed and ‘supposed’ to be protecting dingoes. When is there going to be some commonsense and accountability on the side of human beings? Dingoes are supposed to be protected! 82 Dingoes killed since 2001 from a population of 140 in total on the entire Island. These figures come from DERMS registrar. Minister Jones is so out of touch here. A Dingo dies and a media release from Ms Jones declares these animals are the best protected animals anywhere in the world. Who is this woman kidding? Obviously a fan of Hans Christian Anderson and the ‘Emperor’s New Clothes Story!’ Glad these people are not in Africa. There would be no lions left alive! Rangers supposed to be the carers of this Icon – run around with traps, gings and syringes to exterminate these animals they are assigned to protect. Isn’t that a contradiction in terms? 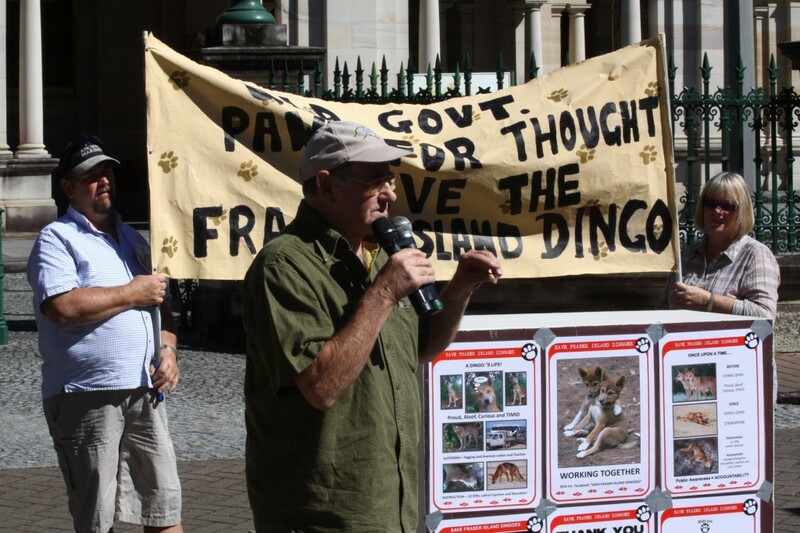 ‘NO More Dingoes KILLED! Federal Minister for Environment, Peter Garrett is vocal about the Japanese killing whales, but hypocritically he is silent on the ‘dingo topic’ and this animal needs protection, is on our turf and also should be given priority before it joins the ranks of the thylacine due to ignorance – of the same mind set – that hasn’t changed in decades by the idiots in power, who should have a complete reshuffle and change in the way they think – from ‘lets kill the pest’ to ‘lets protect and save these creatures’. DINGOES ARE AS IMPORTANT AS WHALES! The dingo gene pool is being destroyed by this constant eradication. Get the parents of their children to be ‘good parents and take some control and responsibility’ – its their duty. Otherwise don’t visit the island – as they jeopardies the very existence of this Australian treasure. Time for the Aussie population to wake up – a very loud ‘Oi Oi Oi’ is required to get this apathy removed and have some commonsense introduced to save the Dingo from extinction on Fraser Island and all across the mainland..
Did you know the Dingo is by ALL Definition Australian Wildlife and has no Universal Protection in ever state of the land? Every other wildlife is protected. This is a NATIONAL DISGRACE. Where the Dingo is granted a pretend ‘protection’ – they are killed when ever gings, traps, bullets, syringes or 1080 baits reach the animal. Dingoes are the very guardians of our future! Where they have been exterminated across mainland Australia there is a massive problem with Fox, Goat, Cat and Pig numbers out of control. This is FACT not fiction. Australia and New Zealand are the last two major countries on the planet allowing the 1080 Industry to rule with mighty force and kill everything – if secondary poisoning is taken into the equation. Ignorance to this eco-vandalism has continued because – from the governing bodies like the department of environment which appears by action to be linked to a powerful farmers lobby which strongly align and support this genocide and ‘billion dollar business’ distributing propaganda which is clearly incorrect in their continuation of baiting even non pastoral locations – such as desert and wilderness zones. This 1080 Arial baiting desecrates the dingo population. Once the Dingo is eradicated in these places, this action destroys the vulnerable population numbers of Bilby, Bandicoot and other endangered wildlife the Dingo protects as ‘LION KING’. The Cat and Fox population takes over once the Dingo is removed. When all the world has banned this Nazi created concoction 1080,- the one question that should be asked is WHY ARE WE STILL USING IT? 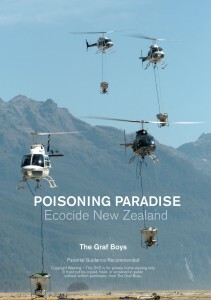 The Graf brothers released ‘Poisoning Paradise’ 3 week’s ago in New Zealand. Displaying for ‘all and sundry’ the dreadful results that have occurred by this dangerous compound being used. 1080 is the dingoes biggest killer. Defoliation is a very important aspect in Australia as the land is in danger of drying up and the Dingo keeps the kangaroo numbers balanced. Scientists are saying loud and clear PROTECT YOUR DINGO – it is the top land predator – ‘OUR WOLF’, which holds all in equilibrium and balance. Don’t add the dingo to Australia’s already disgraceful world record on mammal extinctions! Wake up Aussies before it is too late. Write and demand action now of our politicians which earn their over paid salaries by being made accountable and doing the work they are allocated and assigned to do in their portfolio! Jennifer, would you be so kind as to highlight our effort and course of action by placing our Webpages on your Webpages? We in turn will put your link on our sight. We gain thousands of hits weekly and this is a great good for the dingo. I love the dingo and you also love these animals by your action which is evident.